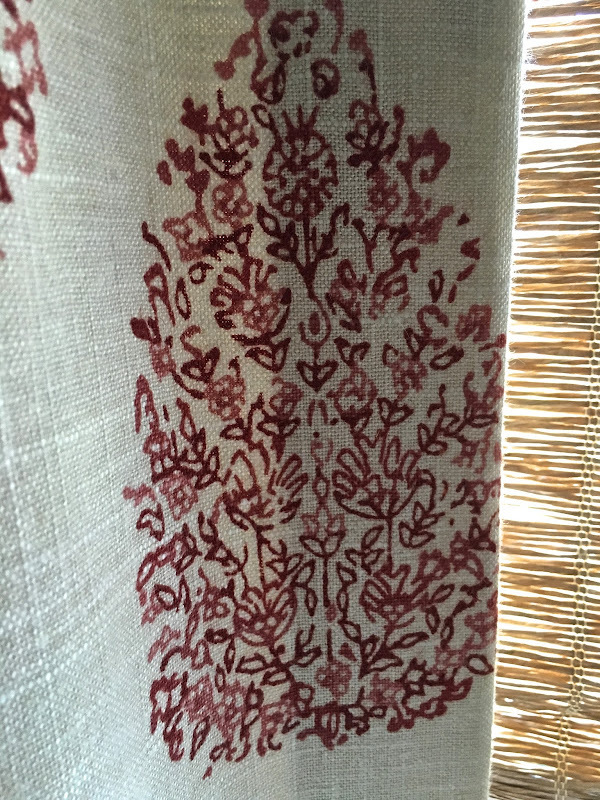 Whether you call them curtains, drapes or draperies, to me they add so much to a room. ...That is until Keith, my "blind man" showed up with the drapes and everything suddenly came together. The room feels warmer now and gone is that echo since the drapes seem to absorb sound. I chose this John Robshaw print to compliment the black and white ticking and add color to a black and white kitchen. Even though I said no red, I ended up with red anyway! It's almost a paisley, but not quite. For the bedroom I chose an ivory linen for the drapes. I went with all ivory fabrics for the window treatments and bed linens to contrast against the gray walls for a peaceful, restful feeling. The only pattern is the zebra rug and throw. The drapes can close at night giving us more light control from that nasty streetlight outside! In the living room, I chose Ralph Lauren's Windstorm Paisley in Desert Sand. It's a tonal tea-stained paisley that goes nicely with the caramel leather chairs. I think it will also look great with the gray velvet sofa if it ever comes! I really like how Keith does his pleats. They're not too fussy. We chose the same rod for all the windows, which he had custom made. The dining room rod will take longer as it had to be formed to the oval shape of the walls. So, no dining room curtains. Yet. 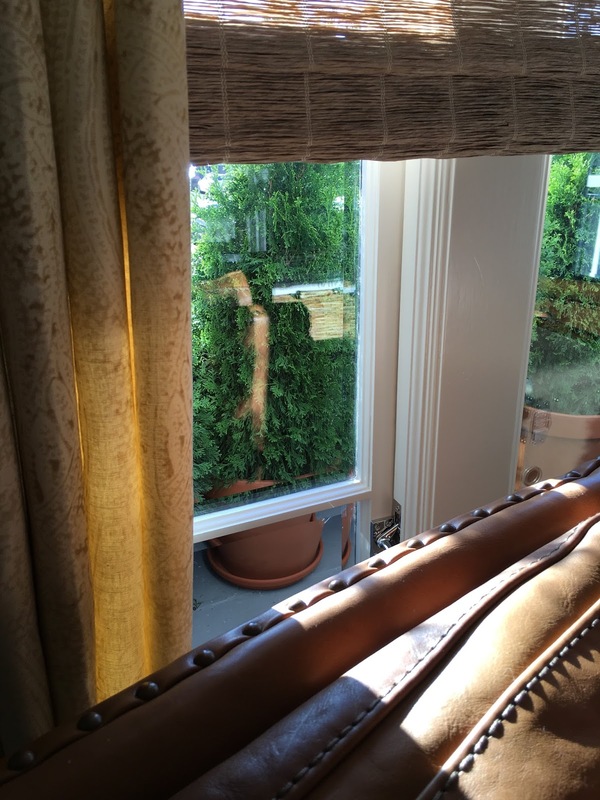 Notice the thuja plants outside the window? I put them there when we did the roof deck. It gives us something green to look at and provides a little more privacy. The living room is a work in progress and has a long way to go. The sofa should arrive by June and a brass and glass coffee table is on its way soon. 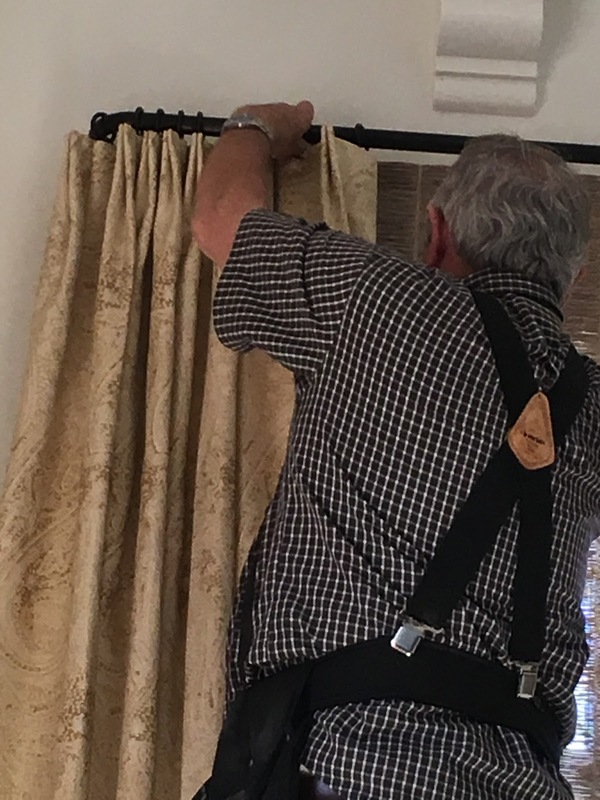 Getting the drapes installed was like Christmas! I can't believe what a difference they make. Hi Delores! I am so happy to see a new post -- I check every day, you know! 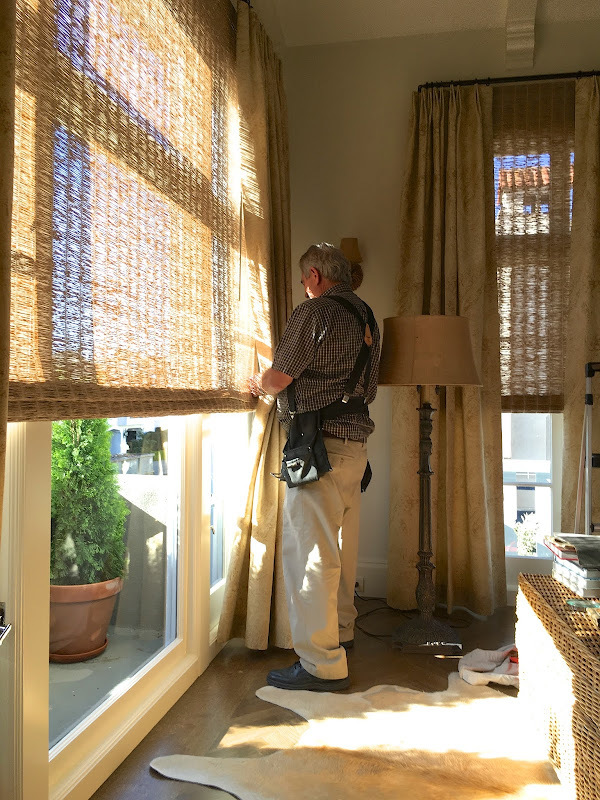 The window treatments are fabulous and the whole house seems to be coming along beautifully. Thanks for the update! Hi D! It is all looking so beautiful and I love the warm touch or red,after all you love red, it should be in your beautiful new home, you chose the perfect shade and pattern!! 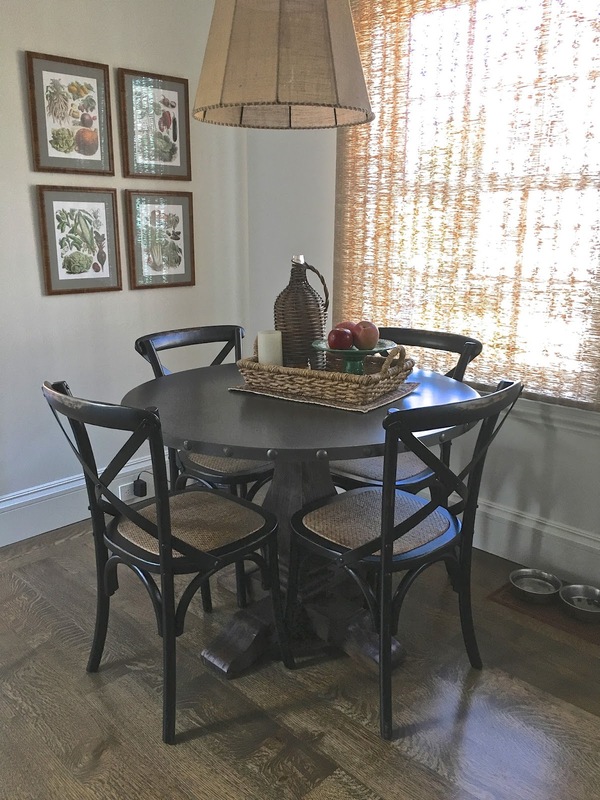 It is so exciting to get new elements for a new home, love everything you have chosen. We are in the process of getting our backyard landscaped, even the trenches are exciting to me, LOL. I love it when you post. The drapes are very handsome and do add so much! I cannot wait for a total reveal. I have always appreciated your style...warm and welcoming. Love seeing this update from you! I know you are enjoying being in your new home. Each step must make you feel more settled. It's all beautiful! I also follow your blog and was happy to see your new touches. The drapes just make the windows have that professional decorating touch. Your choices were perfect. I also love the plants outside the windows. They are perfect. Great job. All the drapes look wonderful. Love your choice of fabrics and the rods are perfect. I guess I always thought of curtains as being unlined and lightweight and draperies as being lined and for large windows. Perhaps it was a term my mom used because she made her own when I was a child. Your bedroom does have a soothing look- a nice welcome for the end of the day. Your home is becoming more stunning, each time I see it. Great fabric choices! Question, are the drapes decorative panels or full length and able to close? Wow, stunning choices. It's all coming together. Thank you for the journey! 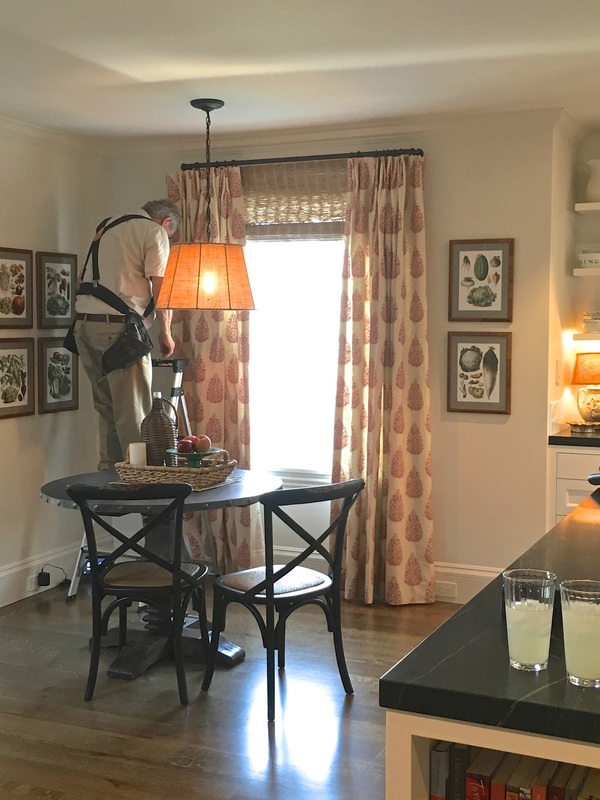 I just love watching your beautiful home come together! It's such a pleasure to see a new post from you. Your new home is beautiful as I knew it would be. 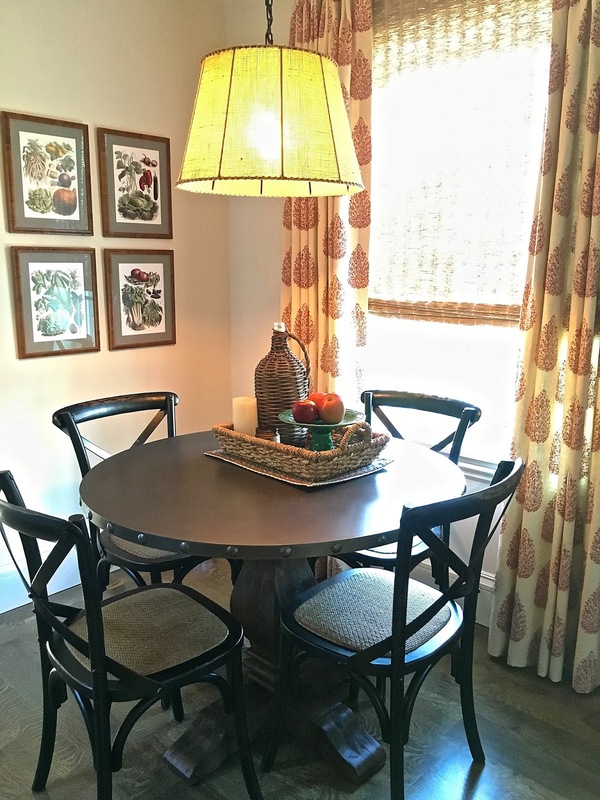 Your home is coming together so beautifully! All the drapes are fabulous and add so much to the rooms! Lovely. Thanks for the details. Your decor is perfect. Looks so beautiful! I love your curtain choices! They really add to your home! Looks so, calm, clean and tasteful! I really love it! I always love seeing what you do in your home. 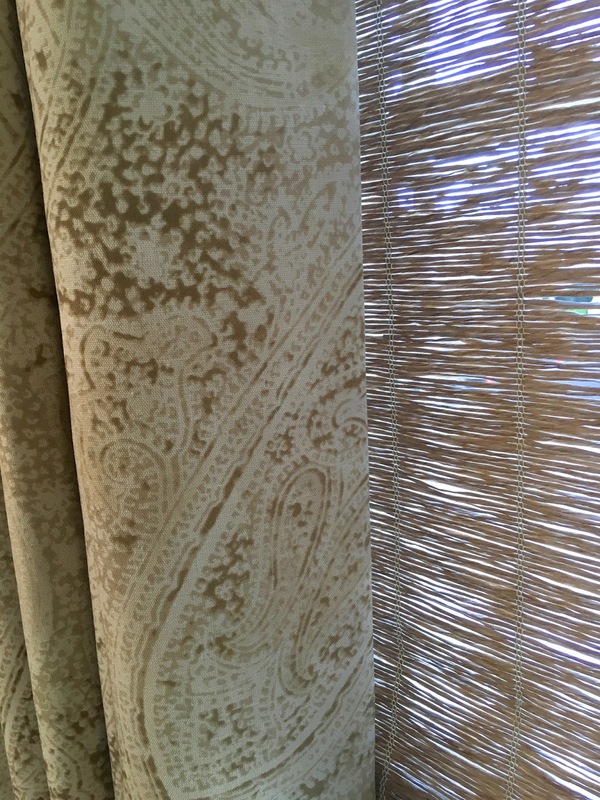 The new curtains really add so much to the rooms and the fabrics you chose are beautiful! You have such vision. Everything looks wonderful. You have done an excellent job. Enjoy your new home. You are patient and that is admirable. Hello I have been traveling and am just getting up to speed on your move to San Francisco. GORGEOUS!!! Thank you for continuing to share your adventures. May I ask, your duvet and bed skirt, where did you find them? Also, your leather chairs with nail head trim, are they the Irving chairs from our beloved Pottery Barn? You've pointed me in the right direction in the past with your divine leopard stair runner when posting from your previous home. Your eye is spot on and your sense of style, inspiring. It's really coming together Delores. Love the linen drapes in the bedroom and I especially love the bed! And of course, I always love the woven woods with drapes along side. Such a classic look!